Here’s your latest interview with 9th place winner Noel Cibaian from the 13th Adonis Golden Ratio Transformation Contest. In a nutshell, I didn’t follow any nutrition or workout routine and just ate whatever I wanted when I wanted. My fitness and health journey started back in 2008 when I visited my doctor for an annual checkup and found out I had hypertension. I always thought I was healthy and the possibility of having high blood pressure had not occurred to me. It was the time when my weight reached 147 pounds, which in 2008, the BMI regarded as “obese” for my height. My all-time high weight was 157 pounds, just two years earlier. Upon using a BMI calculator today, I noticed BMI is now calibrated to regard 150 pounds as “normal” for a 5’ 5” male with 32 inch and half waist circumference. How times have changed. Despite my weight and a mildly protruding belly, I didn’t think I was fat. At least I didn’t look fat when I had my shirt on. My significant other suggested doing some exercises to bring the blood pressure down. I really didn’t know where to start. I just knew I didn’t want to do running just to get in shape. It seemed it was what I always defaulted to doing when I was younger. Unfortunately, surfing the internet for hours didn’t generate any satisfactory result. I was looking for a resistance/weight lifting training program with free weights, but couldn’t find any. At some point, I found a popular DVD based, 90-day, seven days a week functional training program. It was not what I was looking for, but did it anyway because I naively thought it was the only exercise program available. So I worked out 90 days straight with only one day missed and even working out while sick with a cold. I did manage to lose weight down to 135 pounds on the 90th day and my blood pressure did drop down to normal. However, I couldn’t do the program again because quite frankly, exhaustive exercises of 1-1.5 hour sessions for six days a week and with only one day reserved for recovery or stretching for me was not sustainable. This part is going to be long winded, so please just bear with me. Fast forward to 2013 and I was back to 147 pounds and being “skinny fat”. I hurt my back earlier in the year by just bending over to pick up some bags of groceries. This is when I knew I had to do something. Again, I had no luck finding the workout program I wanted, just layers upon layers of online advertisements. Eventually, I bumped into a popular bodybuilding/supplement website but, it seemed it was filled with immature meatheads constantly calling each other names in forum postings. Surely, there is a better way to get in shape. At some point, I did kettlebells and then elliptical machines, but followed no real program. Both turned out to be incredibly monotonous, so I stopped working out altogether. Eventually, in June 2013, I found the newer, faster, better, stronger version of the DVD based 90-day functional program I have done previously. Not knowing any better, I followed the program through, got mildly in shape but still had a gut at the end. Even more depressing was I could not lose as much as weight as before and I was stuck at 147 pounds. I asked myself surely, the ripped trainer in the DVD knew something I didn’t and blamed myself for the lack of progress. Out of curiosity, I did a little bit of research on the program and found that many people have been doing the program many times over with very little or no visible results. The program’s workout mantra was to just keep watching the same DVD workout over and over again until results came. I was not happy at all. Then, I found the bodybuilding version from the same company. I was so excited at the prospect of finally perhaps having a muscular body. It was a 6-day body part split training program. I didn’t mind the hectic workout schedule because I thought I finally found what I was looking for. However, it was not to be. Since it was a traditional bodybuilding program, there was the strict insistence on eating six meals a day and eating in excess of 3000 calories daily, all in the name of building muscle. Predictably, I got fat at the end of the program. So once again, I was back where I started, only feeling a little worse for having wasted so much time. While still doing the bodybuilding program, I found a beginner full body strength training program that focused on adding weight on subsequent workouts as a way to build muscle. The program’s founder looked “muscular” enough, although not in the way the Adonis Index would define what a proportionate, muscular body should look like. He didn’t look like a meathead which was a plus, but he didn’t have that pronounced v-taper look either. He spoke of the glory of getting strong over having the look of a muscular body. The basic premise of his program was, getting stronger eventually translated into bigger muscles. I started the program with some reservations, especially when I saw the “graduates”. Most of them looked pretty ordinary. Some were skinny, some were average looking and few were even looking downright overweight. The muscular ones were fewer still and seem to have uneven muscle development. But they were supposed to be very, very strong. According to this guy, strength is what counts. Then, I looked down at my protruding belly fat, which never went down throughout the program. This is when I knew for sure something was missing in my training. Not knowing any better, I scoured the strength training website for some clues and found a cross-promotion article on Eat Stop Eat. I was only few pages into reading Brad Pilon’s e-book when I decided to fast twice that same week. Within four weeks, my waist circumference shrank into what the Adonis Index refers to as my “golden waist”. During this time, I was still doing the workouts in the strength training program when Brad P. casually mentioned Adonis Golden Ratio in his Eat Stop Eat Optimized e-book. Of course I had my doubts. I got burned several times already and I didn’t want to waste any more time on another program preaching more of the same. But eventually, I visited the AGR website anyway. For me, it was the podcasts. John Barban, Brad Howard and Brad Pilon’s science and research based discussions on fitness is what really sets AGR apart from everyone else. At this point, I was still skeptical about getting a ripped body, so I set my expectations low until proven otherwise. I also liked the fact that AGR also has metrics for the ideal body and perhaps the most intuitive online nutrition software that actually made sense. I didn’t really have any problem with AGR concepts or approaches as far as muscle building or nutrition guidance once I started reading the program materials. However, my first impression of the AGR website was that it was somewhat commercial. Prominent display of third party products and supplements just seemed too similar to every popular bodybuilding/supplement websites I preferred to avoid. It was this initial impression of AGR that made me press the “cancel” button over half a dozen times when purchasing the program. I know it sounds very silly to pick a program based on website impressions, but I’ve been burned several times with false promises from other programs, so I needed a little more convincing that AGR is not one of them. Despite my reservations on AGR’s marketing approach, Brad Pilon’s e-books were so good and informative I just had to give Adonis a go. My thought was, If Brad recommended the Adonis Index, surely it can’t be that bad. My only regret was that, as many AI members have stated before, was not finding Adonis sooner. At first, I was hesitant of joining a contest. About a month before AT13, I was just under two thirds of finishing a full body strength training program. I tend to follow through anything I start with, even if I was feeling very dissatisfied with my results from the program. Eventually, I finished the full body strength training program. I focused on moving on with my training with Category 3 and never looked back. 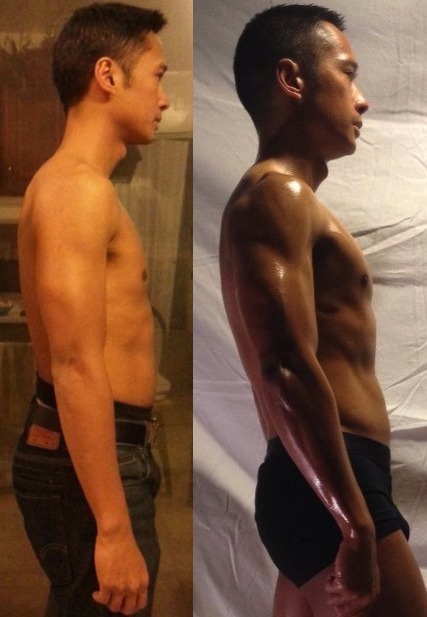 I finally joined Adonis Transformation Contest 13 on January 22, 2014 to get my significant other’s support, rather than just looking overly obsessive compulsive about working out. My experience was that the workouts are awesome. The nutrition portion wasn’t too bad since I already lost most of the fat on my waist, although my abdominal muscles were still not visible. My biggest challenge came from weaning myself out of the caloric deficit mentality. According to the AGR Nutrition Software calculator (aka Reverse Taper Diet calculator or just “RTD”), I needed to eat surplus calories. This is not the 3000 plus “bulking” style, but rather a sensible 200-300 calories above my resting metabolic rate. As far as unexpected, a month into the contest and two months overall in the Adonis Index, my progress seems to have stalled. Worse, when I increased my calories, my waist circumference increased as well, which typically means fat gain. My initial reaction was to cut calories, but another AGR member convinced me to stick to the Reverse Taper Diet recommendation and only lower my calories by a few hundred calories if I wanted to. It was this level of support from the AGR Community that kept me going. Any questions I had, someone in the community knew the answer, or at least point where to look for more information. The reaction from my family was mostly positive. My two sisters are both into fitness, so they could appreciate the results from the Adonis program. My coworkers on the other hand, hardly noticed the change. My missus has been back and forth worried about me getting to skinny, or being too bulky with muscles. To this day I explain to her that such bulkiness can only come from using drugs. Today, I feel very light and “free”. Free to be finally rid of the fat that was slowly eating away my health. It is hard for me to think of my body other than what it looks like now. The credit goes to Eat Stop Eat, AGR, as well as my resolve to make the change. Also, I thought I made a good decision as far as investing in the AGR system. The free podcasts are great, but the Immersion podcasts and the coaching calls made the AGR experience much, much better as far as staying informed. It was definitely a dream come true, to have at my fingertips research information based on actual science rather than just made up “bro” science the fitness industry loves to misinform the masses with. The AGR folks are constantly posting blogs regarding new developments, to ensure its members have the most up-to-date information available, whether it’s on muscle building, nutrition, industry-related information or simply to motivate. I sincerely believe that my physical transformation also translates into positive mental and emotional well-being. I know that my body feels great and I have a more positive about my outlook on life. I feel that there are definitely still a lot more work to do, but I have clearly made progress towards building the body I wanted using AGR in the past months. Or should I say Prevasticus AKA “Prev.” Congratulations on a stunning transformation. You are a champion in our community forum. Always willing to go the extra mile to help others along their AGR journey. Thanks for helping make the AGR system a true testament to others by not only paying it forward; but also by going out and getting personal results! We look forward to seeing more transformation updates from you in the future.